Lottery Looper is a powerful tool with no complicated interfaces to hold you back. You will be creating intelligent numbers in a matter of minutes! How Does Lottery Looper Work? Lottery Looper works by taking a series of snapshots of a running history. It records the best results taken on the applications data so it is able to determine through simulation these results. Each snapshot taken by Lottery Looper constitutes a Best Range it will then analyze the best range results. 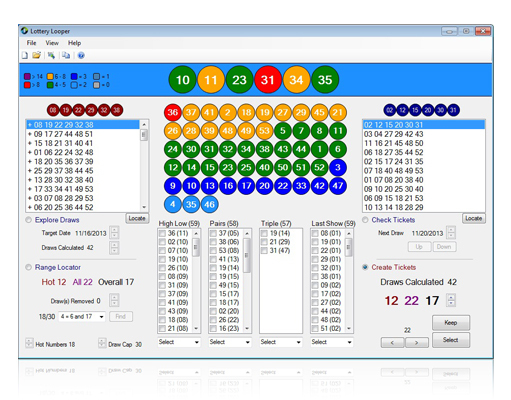 Once a range is selected Lottery Looper will showcase everything about the past history with analytical features so you can start to filter visually when selecting numbers to play. Using many of these new features you can take full-control of your game. Recorded numbers are saved until the next draw and can be checked with a click of a button. Overall Lottery Looper is an extremely flexible, easy to use tool which allows complete control of your game with easy to understand visual aids and cues. How Easy and Flexible is that! PowerPlayer For Pick 3 Pick 4 lottery (Popularity: ) : PowerPlayer Pro for Pick 3 Pick 4 lottery software is a powerful tools. With PowerPlayer Pro for Pick 3 Pick 4 you can track and analyze historical winning numbers, generate new numbers, apply numerous filters and statistics to generated numbers. UltraLott Powerball and Mega Millions (Popularity: ) : Results for the Powerball and Mega Millions lotto are obtainable via a direct download web link. Data Mining (Popularity: ) : Learn data mining with easy-to-use examples. Teach computer to add, subtract, Boolean operations, Fishers Iris task and even chess moves with convenient application NeoNeuro Data Mining! UK National Lottery draw (Popularity: ) : This example shows you how to get the UK National Lottery stats, input it in a MySQL database and display the results.